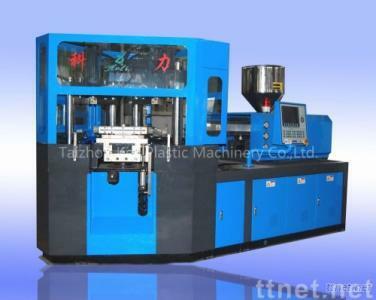 one stage injection blow molding machine for 3~500ml PP,PE,PC,PS,ABS,BAREX material,single layer plastic bottle making in food,pharmaceutical,cosmetic packing industry. Three model SZCX125/25 with screw dia 36mm,SZCX160/45 with screw dia 45mm,SZCX250/60 with screw dia 52mm are availale. This kind of machine used for high precision bottle making ,like little change bottle weight,uniform wall thickness,none kerf,none flash,muticavity,smooth bottle neck,high output,best seaming and bottle screw,used widely in pharmaceutical bottle packing industry. Feature: 1)One step full automatic injection blow molding machine for 3~500ml bottle in food,pharmaceutical and cosmetic packing field with material of PP,PE,PS,PC,PVC,BAREX. 2)It adopts proportional hydraulic control system. 3)Three station arranged at 120 degrees, reduction of the cycle time, increase in production efficiency. 4)Advanced and accurate PID temperature control system. 5)Adopted hydraulic and pneumatic components of well-known brands from Germany and Japan. 6)PLC control system of well-known brands and the whole machine operated easy and convenient. 7) Bottle neck moulded by means of thermo-runner system.High pressure injection making accuracy of bottle mouth,bottle neck and screw thread as well as sealing ability.No joint seam,no leftover bits making reduction of raw material. 8)High utilization of raw material,high yield,high rate of return on investment. 9)High precision in bottle neck and screw,best seaming.